A few weeks ago I received the excellent news that I had won one in a competition. 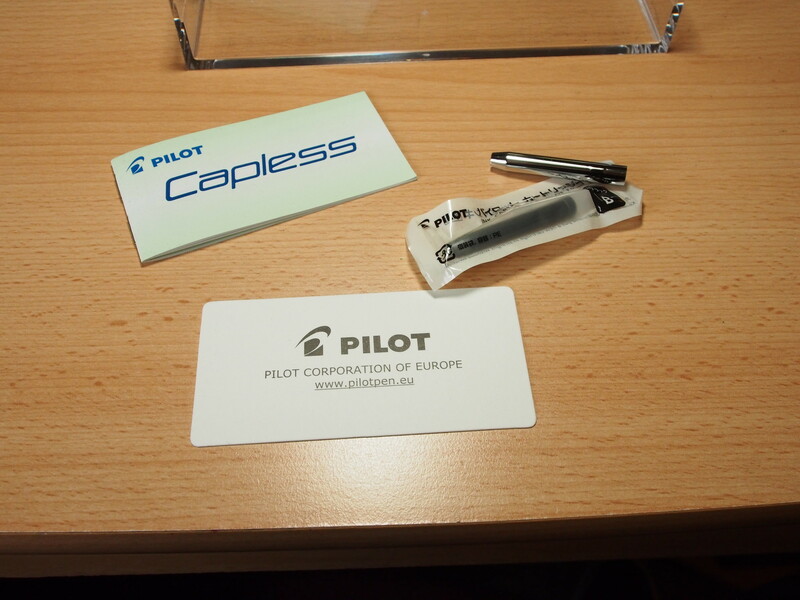 I’ve acquired quite a few pens over the last year, including Pilot pens (some of my favourites), but the Capless wasn’t one of them. If I had to say why, the best I could do would be that the combination of the appearance (which had never looked great to me in photos) along with placement of the clip on the grip made the pen too much of an unknown, especially when taking the price into account. It was on my wishlist, but lower down than a few other pens. So fate intervened when I received the email to say I had won one. I chose the Matt Black finish (which looked the best of the ones available, especially considering other reviews I had seen) and a medium nib. My preference is normally for Western fine nibs, and Japanese mediums. 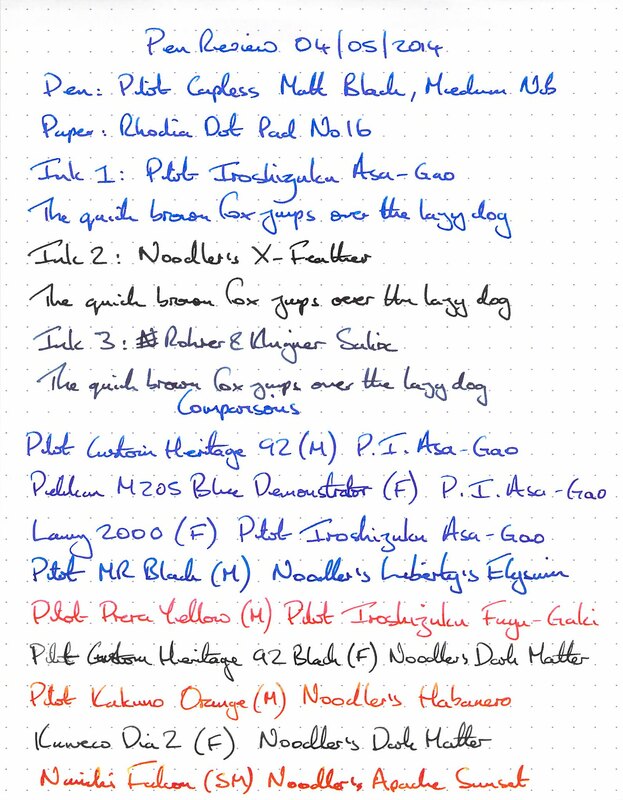 All the other Pilot pens I have bought in the past confirm me in that view (the two fine nibs I have tried have been just that little bit too fine). So what did I think of this pen? 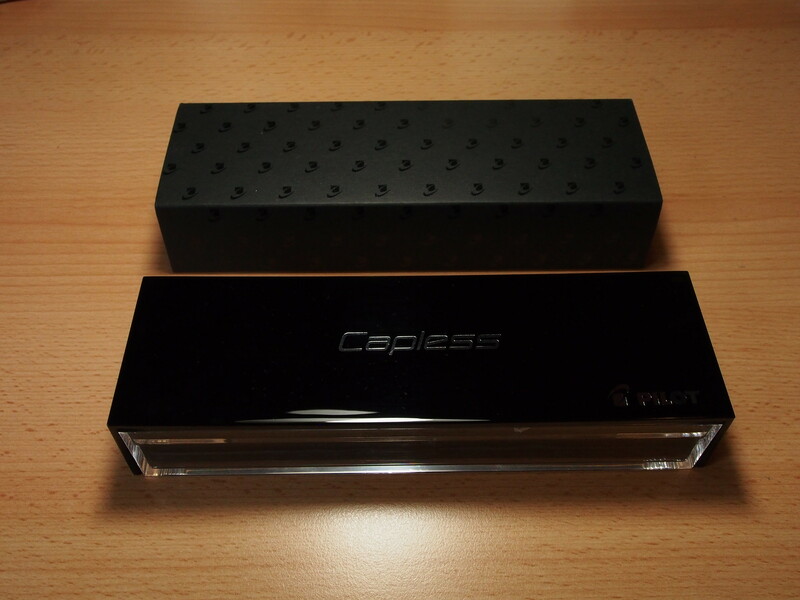 The pen came in a shiny plastic box with cardboard slip cover. 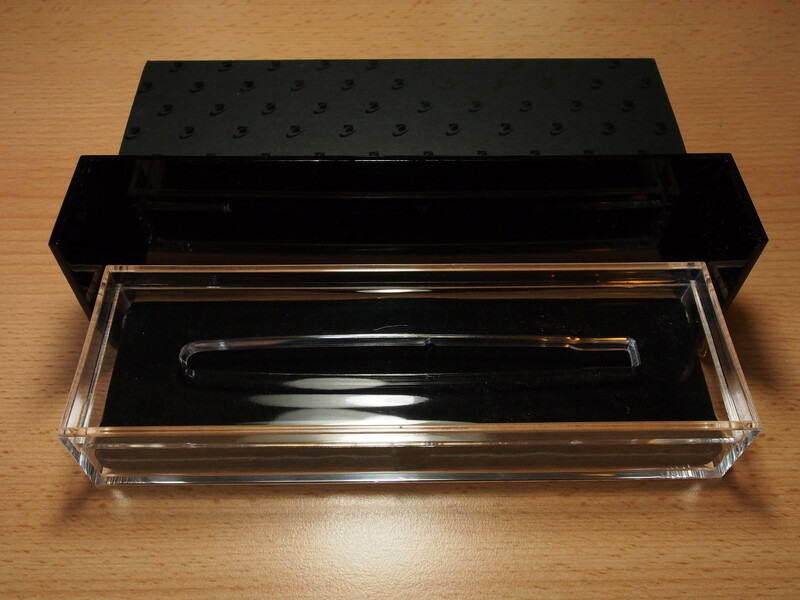 I was a little surprised to find the pen itself has been individually wrapped in bubble wrap, but could soon see why. Straight out the box the matt finish easy picks up what I can best describe as “scuffs”. I dread to think what the hard plastic inset would have done to the finish in transit without the bubble wrap. Good call Cult Pens. 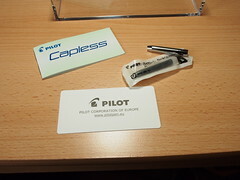 Under the plastic inset is a compartment holding the free cartridge, cartridge carrier, instructions and warranty card. I didn’t test the pen with the cartridge/carrier. I don’t judge a pen by the box, but Pilot would have been better off with something that concentrated more on protection than aesthetics. The box also picked up dust like nothing else I’ve ever seen before, but again this is a trivial consideration (so is the fact it was murder to photograph). 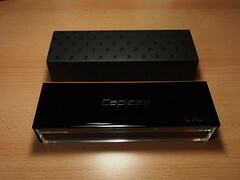 Although it’s not what I would call the most elegant of pens, the Capless looks (and feels) much better in reality than I thought it would from the photos I had seen. Ultimately though its function determines its form, so I have to take that into account when considering its quirky looks. It’s not very sleek with the nib retracted – much better when the knock is pushed in and the nib is out, and the clip placement does look weird, but for the life of me I can’t see how else it could be done. I’m not a great fan of hooded nibs either, but again I can see the necessity in this case. This is all a matter of taste though. I also noted that the scuffs on the matt black finish quickly disappear under finger prints. While I wonder about the long term durability of the finish only time will tell on that. 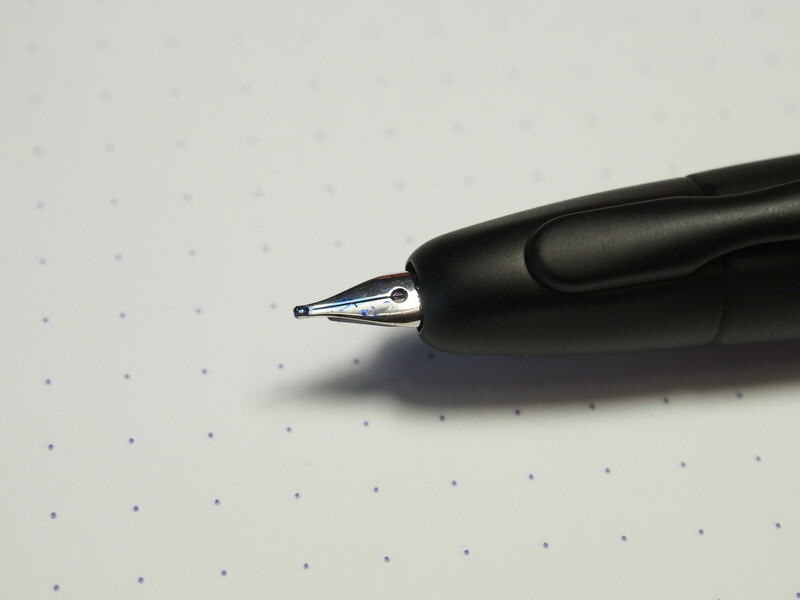 So, as it’s not the most elegant pen in the world, how well does it function? In short – it’s great. 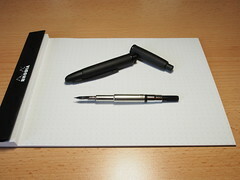 The pen feels neither too heavy nor too light. Although the diameter is greater than I would normally prefer this does not make it uncomfortable to hold. I was actually nervous when I first inked the pen up. I was concerned about both the grip and what the flow would be like with such a tiny nib. However, all my fears about the grip disappeared the instant I started to write. The clip rests comfortably between my thumb and index finger and the matt finish also makes the grip doubly secure, so no problems there. I do wonder if the other metallic finishes would feel so good. 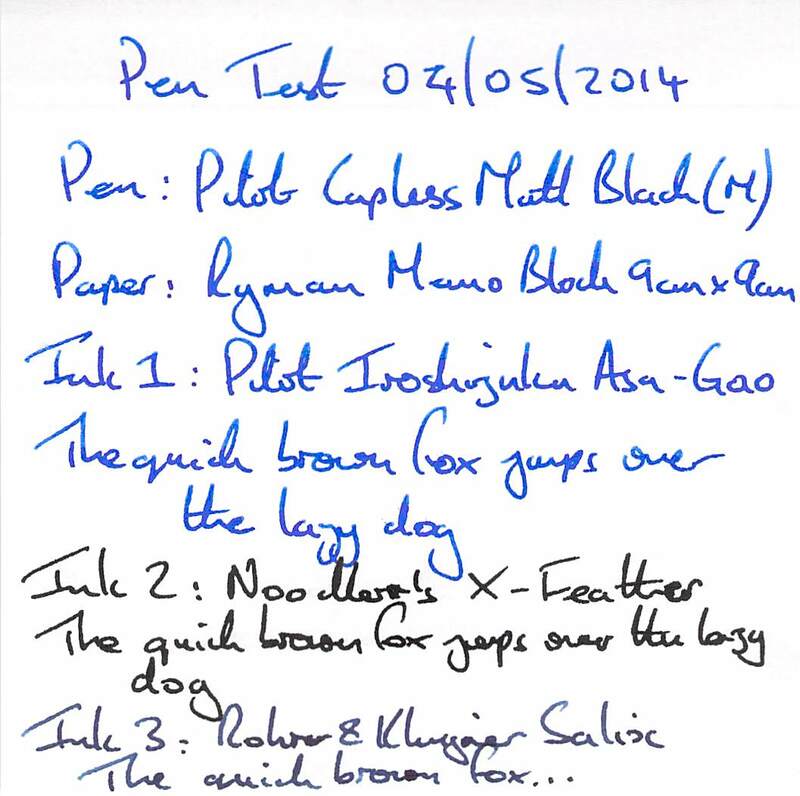 The first ink I tried was Pilot Iroshizuku Asa-Gao which is my favourite all-round blue ink. Not only did I find the flow good, the nib is one of the wettest writers I have used, certainly when combined with Asa-Gao. I prefer wet to dry nibs, so this is good from my perspective. There is some feedback when writing, but nothing uncomfortable. 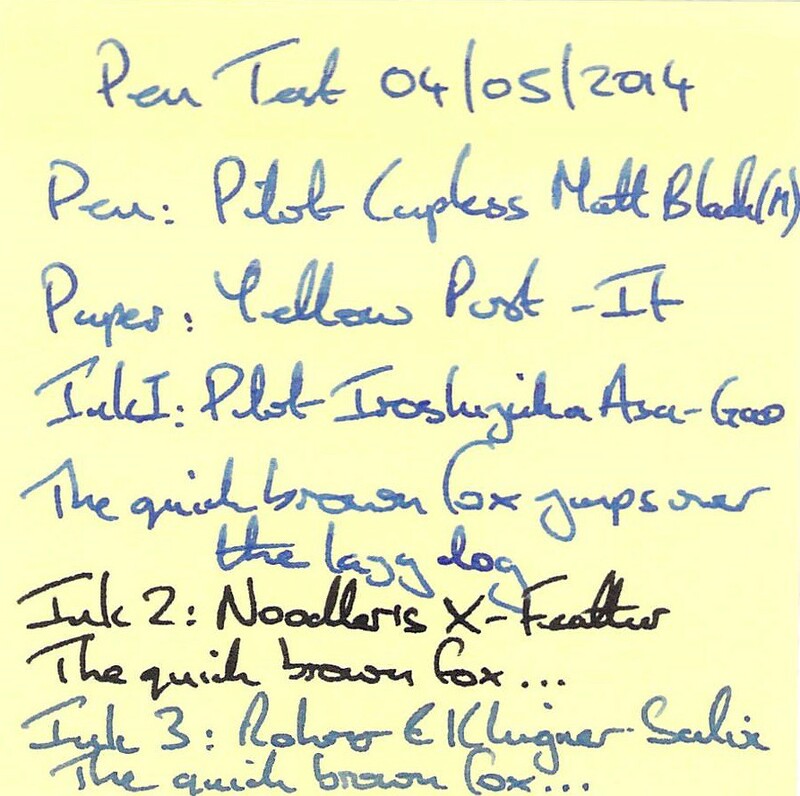 While I could force some line variation out, that’s not one of my main concerns for a general note-taking pen. 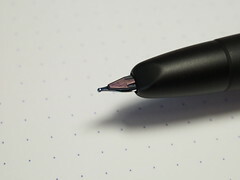 Cult Pens say on their website that the Capless medium nib is closer to a Western medium, and I would tend to agree with this. If I wanted to use black ink in one of these pens on a regular basis I would probably want to try a fine nib. 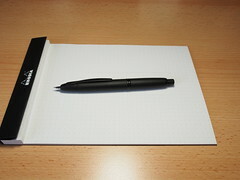 I tried Noodler’s X-Feather, which was one of the better performers on Fields Notes Paper, but the line was a little broad for my taste. After a few days use the convenience of being able to write with just a click really started to appeal, and the pen has become a serious contender for travelling in my jacket pocket on an everyday basis – a place that no other fountain pen has occupied for any length of time before so this will be interesting. The clip feels secure enough to cope, although the edges are a bit sharp. It will be interesting to see how the finish stand up to the rough and tumble of being in the pocket. 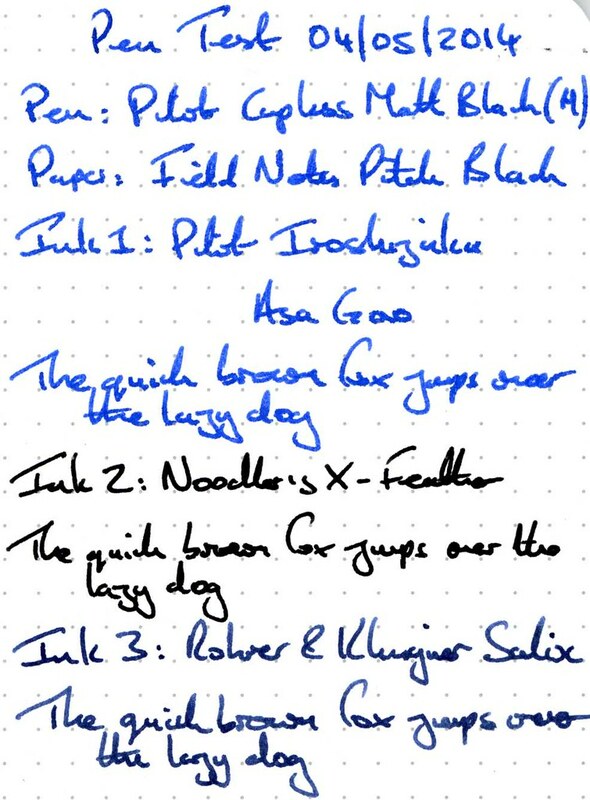 For the “everyday carry” test I have changed the ink to Rohrer and Klingner Salix, which is water resistant when dry and I find writes a little drier than Asa-Gao. My hope is to reduce the chances of smudging. I like this combination a lot – the flow is a little drier, but not too much for my liking. 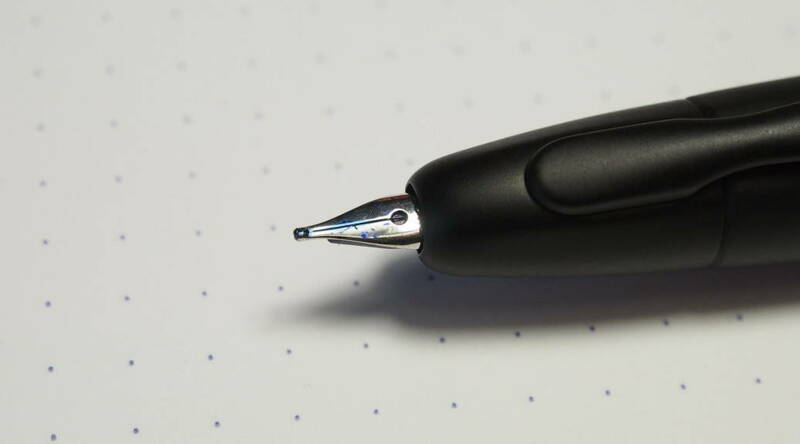 The click of the knock is firm and authoritative, and the mechanism doesn’t rattle when writing normally (unlike a lot of ball point pens I can think of). Cleaning was a lot easier than I expected. I haven’t attempted to clean the trap door which shields the nib when it’s retracted. The jury is out on whether that will ever be needed and if so how easy it will be. The only real complaint is the size of the ink window when the cartridge converter is fitted into the metal carrier to keep it in place – that’s assuming it really is intended to be an ink window. If it is, then it’s too small – it’s possible to see ink through the gap, but very difficult to gauge how much is present. I don’t see why slots could not have been cut in the carrier to give a better view. This has quickly become one of my favourite pens for general note taking – it’s a pleasure to use. 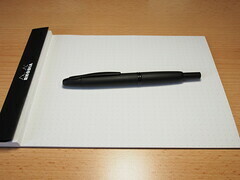 I would like a better ink window, softer edges on the clip and a nib that is closer to other Pilot medium nibs (i.e. slightly finer), but these are minor drawbacks and I may try a finer nib unit when funds allow. It’s difficult to comment on the Value for Money of a pen that I didn’t actually pay for, but if I try to put myself in the position of how I would feel if I had paid retail price for it, then I think I would be happy with the purchase. It’s in a similar price bracket to the Lamy 2000, and while they are very different pens I think they are well matched in terms of build quality and performance (and I prefer the grip on the Pilot Capless). This is definitely a welcome addition.